The answer to these questions is found in the parable of the soils in Luke 8. Jesus traveled from place to place preaching and teaching the good news. In our text, we can clearly see how people reacted to the proclamation of the gospel; how well they listened or not to the gospel. When we announce the word of God today; people react the same way. Let me show you how. Whoever has ears to hear let him hear (v.8) Jesus calls the people to pay close attention. It is as if he is saying “listen up people”. 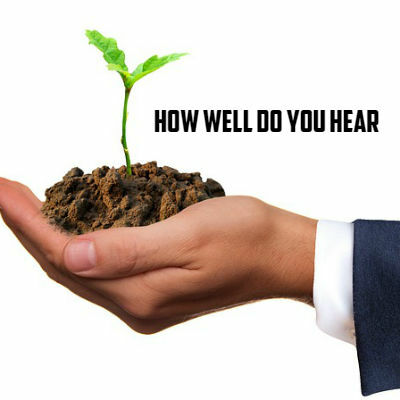 There is a difference between having ears and having “ears to hear.” In this parable, Jesus compares the types of hearers: those who let the Word of God pass straight through their ears and those who truly listen and seek understanding. The parable separates those who care about spiritual matters from those who don’t care. In other words, Jesus knew in the audience there were some who heard and not understood because they didn’t seek to understand. The disciples are the ones who always came to Jesus and asked for the explanation of the parable. They were seeking understanding, they wanted to know, then God would let them know. – The Rocky Soil: (v.13) Those who hear and receive with joy what they hear. They have no strong roots; believe for a while, until time of adversity, then they fall away. These are fair-weather followers; they follow Jesus so long as things go well. – The Thorny soil: (v.14) They hear and receive the word; but the word gets choked by thorns. (life’s worries, riches and pleasures choke the development of God’s word in their life) These never get to mature. There are lots of Christians who don’t experience maturity in their lives because they allow the thorns to choke God’s word in them. – The good soil (v.15) Those with a noble (honest) heart; they hear and receive the word; and retain it and persevere in it. They mature and produce a harvest. These are the one who hear with their hearts, not just with their ears. The word of God produces changes and transformation in our lives; Those who listen to it represent the types of soils. Some just hear but don’t receive it; some receive it, but only for a while, as longs as things go well in their lives. Some hear and receive it, but they let the pursue of pleasures, riches and worries of life choke God’s word; they don’t develop or mature as followers of Jesus. Some truly hear, receive, retain and persevere in it. They are described as having a noble heart. They are the ones who become fruitful in the kingdom of God. They listen with their hearts and their transformation is undeniable. The productivity of God’s word in you depends upon your receptivity; how well we receive it. If we don’t hear God’s message with our hearts, we won’t see any changes in our lives. Jesus said a farmer went out to sow his seed. The seed is God’s word and anyone who proclaims it is the sower. I just scattered it among you today. I wonder how you will receive it. He who has ear, let him hear what the Spirit says to the church.